In just four short years we had developed way beyond 007’s pager and car telephone combo – we had in car video screens up and running for YOLT. Mind you, it was set in Japan. They were probably old hat by the time British audiences got to see the wizard gadgetry. Of course now, just like the Closed Circuit Televisions, in car colour TV, even with live pictures (although it would have required an aerial, which wasn't visible on the beautiful Aki's equally beautiful Toyota 2000GT car), is every day equipment, available from lots of places. Yo can change your vehicle into a moving movie theatre with this overhead flip-down monitor. 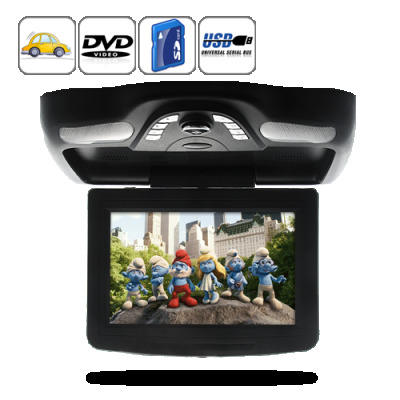 You can connect it to your car DVD player or a portable player and adjust to any angle to watch films on the go. You just remove the four screws at the bottom of the unit to undo the metal support bracket so you can fix to the roof of your car.